Three states to enforce quarantines for all travelers from West Africa. The New York doctor who tested positive for Ebola wasn't required to quarantine himself when he returned to New York City after treating Ebola patients in Guinea. Instead, Dr. Craig Allen Spencer went about his life, hitting a popular restaurant and bowling alley before his diagnosis -- and sending health officials scrambling in the aftermath. But the rules on quarantines are changing. Governors in New York and New Jersey announced today that they would enforce mandatory quarantines for all travelers who had contact with Ebola-infected people and were arriving from Guinea, Liberia and Sierra Leone. This comes one day after Spencer’s Ebola diagnosis, and two days after the U.S. Centers for Disease Control tightened guidelines to require 21-day self-monitoring -- but not quarantines -- for travelers to Ebola-affected regions. In addition, the Illinois Department of Public Health late today also announced a mandatory 21-day home quarantine for high-risk individuals who cared for Ebola patients in the same countries. Earlier today, a woman who cared for Ebola patients in Sierra Leone was quarantined in Newark, New Jersey, after her plane landed. She was originally quarantined despite not having any symptoms. Hours later, however, officials said the woman, who was not identified, has a fever. "This marks a very different approach, quarantining someone who wore protective gear when they had contact with an Ebola patient. It would not be based on science, which would say she is not at risk," said Dr. Richard Besser, ABC News chief health and medical editor. "However, given all the work the city has decided to undertake because Dr. Spencer was around town before he got sick, perhaps that is why New York and New Jersey have decided to take a different approach." Doctors who have treated Ebola patients in West Africa are required to self-monitor for the 21-day incubation period, but they are not required to self-quarantine, according to guidelines from Doctors Without Borders, for whom Spencer was working overseas. "Self-quarantine is neither warranted nor recommended when a person is not displaying Ebola-like symptoms," the organization said Thursday in a statement. "However, returned staff members are discouraged from returning to work during the 21-day period." This fits with CDC guidelines, which indicate that because Spencer was wearing protective gear when he was around Ebola patients, he was not required to be quarantined. 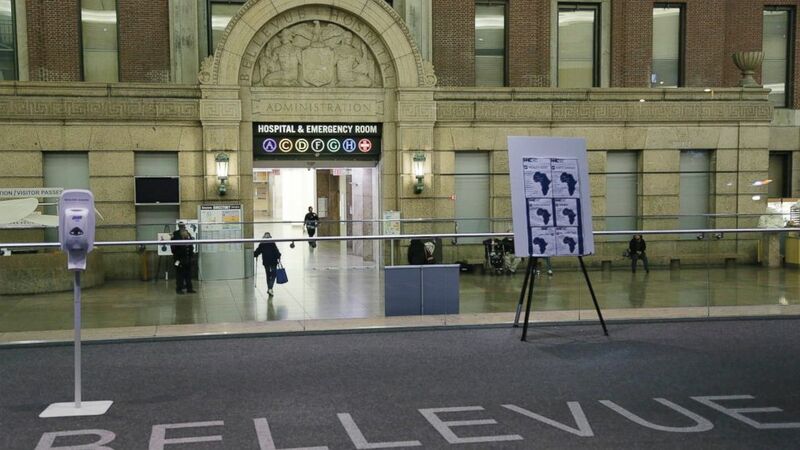 (Mark Lennihan/AP Photo) The lobby of Bellevue Hospital is seen, Oct. 24, 2014, in New York. Spencer, 33, had been treating Ebola patients in Guinea until Oct. 12, New York City Department of Health Commissioner Dr. Mary Bassett said today. Spencer left Guinea on Oct. 14 and arrived in New York's John F. Kennedy International Airport on Oct. 17 following a stopover in Brussels, Belgium. Doctors Without Borders Guidelines requires doctors like Spencer to take their temperature twice a day and to stay within four hours of a hospital for the 21-day incubation period. They are also supposed to contact Doctors Without Borders if they developed any symptoms. The CDC announced on Wednesday -- after Spencer arrived back in the United States -- that all airline passengers traveling from Ebola-affected nations would get Ebola kits and be required to self-monitor for 21 days. They are required to take their temperature twice daily and answer several questions about their symptoms, according to the CDC. If they do not report, they will be tracked down, the agency said Wednesday. In the days before Spencer was diagnosed with Ebola, he traveled to Manhattan's Highline Park and a popular restaurant called The Meatball Shop on Tuesday. The next day, he took a 3-mile run along Riverside Park and traveled on the subway to Brooklyn, where he went bowling. He was fatigued, but had no fever, officials said. On Thursday morning, Spencer recorded a temperature of 100.3 and called Doctors Without Borders, who contacted New York authorities. Emergency responders arrived at his northern Manhattan apartment in full protective gear and took him to Bellevue Hospital, where he was placed in isolation and later diagnosed with Ebola, according to officials. Spencer's fiancee was placed in quarantine, but she has shown no symptoms so far, officials said. "Until today, out of more than 700 expatriate staff deployed so far to West Africa, no MSF [Doctors Without Borders] staff person has developed confirmed Ebola symptoms after returning to their home country," Doctors Without Borders said in a statement.